As such, it’s become a major rarity, prized by gamers and fans of Niven’s Known Space setting alike. When Niven started the Man-Kzin Wars series, in which he set aside a particular span of time in his future history for other authors to play with in a shared-world fashion, he needed a writer’s bible for the setting – rather than writing one from scratch he just photocopied the RPG. Wendy and Richard Pini’s Elfquest comic, a landmark of independent comic publishing, emerged in the 1970s alongside the rise of tabletop RPGs, but as Richard Pini notes in his introduction to the 2nd edition Elfquest RPG rulebook (comprising the core Elfquest rules and the supplemental material previously issued in the Elfquest Companion) at first the married creative team didn’t give much thought to RPGs, not seeing the point of using dice and rules to constrain creativity. With the passage of time and increased exposure they came to the conclusion that RPGs were a valid creative field in their own right, and when Chaosium came a-courtin’ to seek the RPG licence a deal was soon reached. 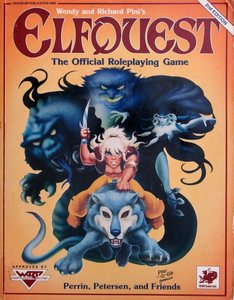 However, the Elfquest RPG isn’t as fondly remembered as other Chaosium RPGs of its vintage. In more recent years Sandy Petersen has gone on the record about some of its issues; apparently, far from the impression given in Richard Pini’s introductory comments, it wasn’t Chaosium who approached the Pinis, but the Pinis who came to them – and at first Wendy Pini was very uncomfortable with the idea of participants in the RPG being able to bend, fold, mutilate and destroy the canonical Elfquest characters until she eventually got the idea that Elfquest RPG adventures would be, in comics terms, “what-if” stories rather than canonical tales. Overseen by Steve Perrin, original system-wrangler for RuneQuest and thus the father of Basic Roleplaying, the Superworld game line was an outgrowth of and elaboration on the Superworld booklet from the Worlds of Wonder boxed set. Worlds of Wonder was an early attempt to push the idea of Basic Roleplaying as a generic RPG, since it presented the original Basic Roleplaying booklet with some rather perfunctory genre booklets – Future World, Superworld, and Magic World. The cynic in me suspects that the actual motivation behind Worlds of Wonder was to find something to do with an overstock of the Basic Roleplaying booklet – with second editions of Call of Cthulhu and Stormbringer rapidly taking the step of integrating those rules into their main text, which was found to be preferable to having to flip back and forth between the Basic Roleplaying booklet and the main book for the game in question, I think Chaosium probably found themselves having to work out what to do with the excess booklets they’d printed. That theory would certainly explain the total lack of support that the core Worlds of Wonder box received, and the swift abandonment of most of the tangents proposed therein. 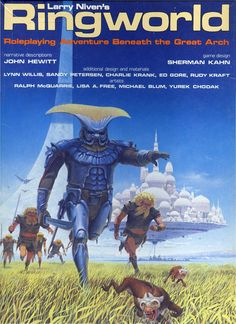 Future World was dropped completely; Magic World was abandoned and though a game of that name was eventually released in subsequent years, in practice that version didn’t have all that much to do with the original Magic World booklet beyond the title; it was more of an attempt to reprint the late-edition Stormbringer rules in a setting-neutral fashion after Michael Moorcock pulled the Eternal Champion licence. To round off my run of Call of Cthulhu reviews for the time being, I just want to take a moment to express my confusion about the 5th Edition Keeper’s Kit. This was basically a GM screen with associated booklet, as has become common. The screen itself has this gorgeously simple design – deep blue background with arcane symbols, very setting-neutral, very basic but somehow all the more atmospheric for that. It comes with perhaps the most bizarre mish-mash of nonsense I’ve ever seen someone put out for the sake of padding out a GM screen offering; there’s a cut-out model of the Strange High House In the Mist, which is odd because that’s pretty much the last locale I think anyone would particularly want a standee of, and a bizarre adventure from Keith Herber that casts the investigators as gangsters chasing leprechauns with the serial numbers filed off and a Gremlins-esque aesthetic in the Arkham sewers. Weird… yeah, that’s the word for it. Weird. Under the Charlie Krank-Lynn Willis regime, before Willis passed on and Greg Stafford and Sandy Petersen lost patience with Charlie Krank and ousted him from control and installed Moon Design at the head of Chaosium in his place, one of the weirdest little schemes Chaosium ran was the monographs project. This was a line of booklets for Call of Cthulhu or Basic Roleplaying which were submitted by fans and freelance writers, and which had more or less all the editing and layout work done by the writers themselves, released with a caveat to that effect under some standardised Chaosium trade dress. In principle, this was a nice way for Chaosium to make some money out of people’s fan writing and fans to get their ideas out in front of a broader audience thanks to having the Chaosium name attached to their work. To that extent, it was kind of like a precursor to what Wizards of the Coast are doing right now with the Dungeon Master’s Guild program on DriveThruRPG (which has in turn inspired other companies like Atlas Games and White Wolf to set up similar programs for their game lines). However, the execution left much to be desired. For one thing, Chaosium was a weirdly late adopter of PDF sales (which you’d think the monograph format would be absolutely ideal for), was even more late about getting their material up on DriveThruRPG (the major platform for RPG PDF sales – if you aren’t there, you don’t exist so far as a major segment of the market is concerned), and didn’t price them especially reasonably. As far as printed copies go, you’d think that print-on-demand would be the order of the day, but evidently that wasn’t the case – because when Greg and Sandy kicked Charlie Krank out and did an audit of the warehouse they found stacks and stacks of unsold monographs. Now, don’t get me wrong: I don’t think Vampire: the Masquerade should be all about the Inconnu all the time. But it seems to me that the near-disappearance of the Inconnu from setting material after the earliest years of the game is indicative of broader changes in White Wolf’s approach to the game – a shift to a more sober, buttoned-down, serious-minded approach that I increasingly find antithetical to fun whilst still being too tied to the absurdities of the game’s axioms to be a profound exploration of serious subject matter. The Inconnu in this respect are like the bellweather, the canary – sure, they had a single supplement in the Revised era as a prelude to Gehenna, but I have a strong suspicion that this was because White Wolf needed to fill a hole in the schedule and if they could have got away with doing the whole Time of Judgement thing without touching the Inconnu they would have. 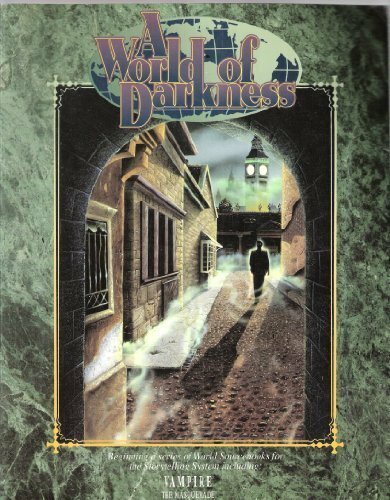 Take, for instance, the original A World of Darkness supplement from 1992. This is one of the first Vampire: the Masquerade supplements to get really significantly retconned; a second edition of it in 1996 made major cuts to the existing chapters to excise material that was no longer wanted, and added additional chapters to allow for a properly global overview. You have to give it to Mike Pondsmith. Yes, recent designs of his have included serious misfires like Cyberpunk v3, a terrible mess of doll-based artwork and paper-eating viruses and continued flogging of the dead horse that was the Fuzion system that resulted in a game that nobody actually wanted. Sure, that game was so poorly received that Pondsmith’s R. Talsorian Games has effectively disowned it, reverting to promoting the previous edition of Cyberpunk instead. But when Pondsmith does get a grip on the zeitgeist – as he did with Cyberpunk 2020 – he’s a real master at getting you fired up for what he’s offering. One of the things I respect most about the game – and something which makes it still a viable choice for cyberpunk-themed gaming despite many of its baseline assumptions either no longer being science fiction or clearly having been rendered nonsensical by the passage of time – is that in the first chapter, when it’s laying out the baseline axioms of life in the cyberpunk future, it declares that number one is “Style over substance”, and for the rest of the book it takes that attitude to heart, making what would have been a point of criticism a badge of pride. 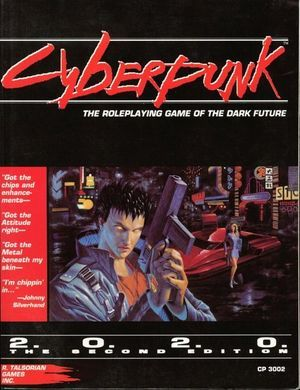 There’s a place for games with a sense of, if not realism, at least a rigorously thought-out setting with a strong sense of verisimilitude – that was the dominant mode when the first edition of Cyberpunk came out, after all – but Cyberpunk really blazed a trail for games where you don’t sweat the setting details so long as they arrive at the aesthetic you want. Shadowrun thrived on this, Vampire and its successors work much better if you take this approach to them, and numerous other games (especially during the 1990s) also took this route, and it’s largely thanks to Cyberpunk. Which isn’t to say that the book is insubstantial – in fact you get a heck of a lot in here. You get character generation, combat, netrunning and all the other rules you’d expect from a cyberpunk game, plus a sample setting (Night City) with sufficient detail to get you rolling straight away. You also have some fairly reasonable advice for running the game – like “choose a concept for the PC team and have the players make characters with an eye to that rather than going full sandbox” – though this is also mixed in with a somewhat adversarial GM-vs.-players attitude. Cyberpunk runs off the Interlock system, first aired by R. Talsorian in the Mekton II mecha anime-inspired RPG. This largely means you are dealing with skill plus stat plus 1D10 against a difficulty number (or the other fellow’s roll), along with a fun lifepath system which gives your character a bit of a genre-appropriate backstory. The two major things people cite as issues in cyberpunk games of this vintage definitely exist, but at the same time aren’t actually as big of problems in this context as they are made out to be. The first is the whole cyberpsychosis thing, where the more cyberware you install the more your Empathy stat goes down. Yes, this is transparently a brake to stop you installing every bit of cyberware you can and becoming a flat-out superhuman. However, each item in question doesn’t yield a direct Empathy loss, but gives you a certain number of humanity loss points – and your Empathy only goes down when you get ten of those. The actual costings of items are actually quite modest by comparison, especially when it comes to things which realistically speaking shouldn’t mess with your sense of who you are and what your personal capabilities are like prosthetic limbs. You only get the really serious hits when you start installing a bunch of stuff which puts your capabilities well beyond the human norm, which realistically speaking you should expect would put you at risk of a certain amount of hubris. And because you can install up to 9 points’ worth of cyberware before your Empathy even drops by a single, solitary point, that can actually account for a fair bit of cyberware – and if you buy up Empathy specifically to allow for more purchases, you can really go to town. When you combine this with a reminder that this is meant to be a very stylised game, which only goes to the realism well when doing so makes sense for the aesthetic it’s going for, and this really isn’t that much of a problem. Really, the only major thumbs down I have with the core Cyberpunk 2020 book is the art. Partly this is because whenever a woman is depicted she is usually in a skimpy and/or figure-hugging costume and is doing a boobbutt pose, which is tiresome. But mostly, it’s because the artwork isn’t anime enough. This is the hidden secret of R. Talsorian Games: as far as their major in-house projects go, they’re the original anime RPG company. Not in the Big Eyes, Small Mouth sense, because they’re smart enough to realise that anime is a medium and not a genre and there’s distinct genres within that field, but think about it: the Mekton games are overtly based on mecha anime. Whilst Cyberpunk pushes the various cyberpunk novels of the era as inspirations, there was also a strong cyberpunk strand in 1980s anime. Even Castle Falkenstein feels in some ways reminiscent of the not-really-Europe that anime sometimes resorts to as the settings of material like Howl’s Moving Castle or The Castle of Cagiostro. We know from history that major leaps forward happen in the RPG field when people find useful ways to tap into other fandoms. Playing At the World makes a very convincing case that whilst Dungeons & Dragons emerged from the wargaming community, its rapid early spread came about because of it being adopted by the science fiction and fantasy fan community. (This was a factor in the early RPG scene having a much healthier gender balance than the extremely male-dominated wargaming community of the day.) Vampire famously spearheaded a boom by bridging gamers and goths. Pondsmith, for his part, got his start in the RPG publishing field effectively by standing with one foot in anime and one foot in gaming, and whilst this isn’t commonly declared as being a moment when substantial numbers of new people came into the hobby, a case can be made that Pondsmith’s particular take on RPG design, which would be so influential for much of the 1990s, would in part be inspired by that mix of interests.